We made two trips to Oregon: one in April, and one in May. 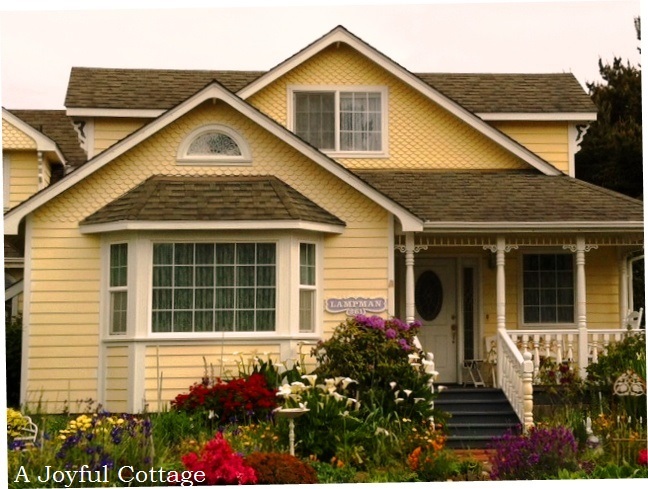 The charming cottage in the photo above resides in the quaint seaside village of Yahatz, Oregon, where we stayed in May. 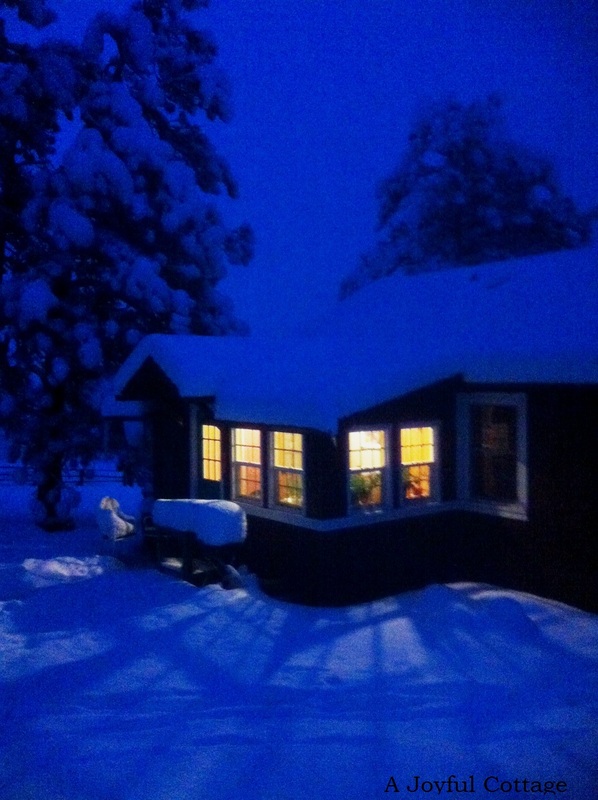 When we left Colorado, our cottage was covered in two feet of snow. Sure it looks beautiful, like a Christmas card, but instead shouldn't we see a May pole on May 1? I long to live in a climate where Spring actually arrives on time. I like the Rockies, but our growing season is very short. Spring comes in June. Not good for a girl who loves to see daffodils in April. 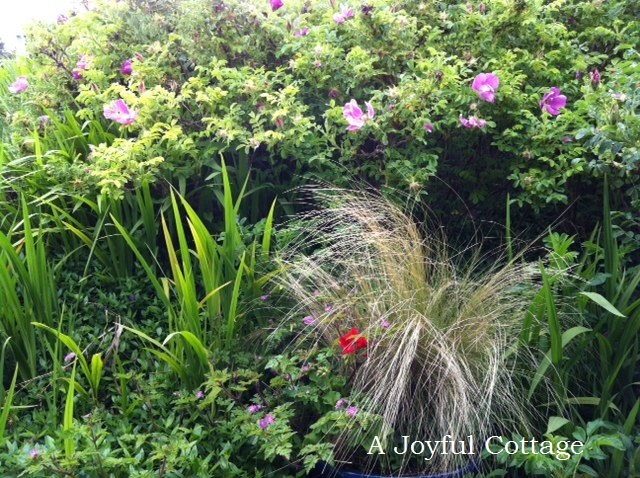 The gorgeous florals in the front of the Yahatz cottage is my idea of a perfect May garden. Delightful. 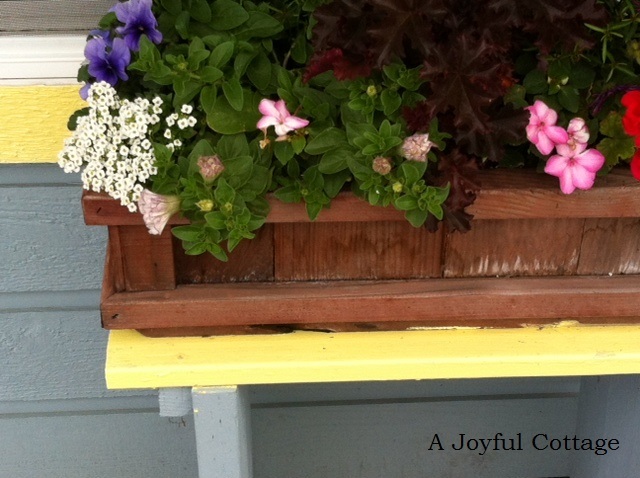 The flower boxes outside our room at the Ocean Cove Inn brought a smile to my face. I love those little benches. The room's back door opened up to these lovelies. This was my first visit to the Oregon coast. Its rugged beauty is very much what I expected. After our house closes on July 1 we'll head back to Oregon for a serious look at real estate. One of the towns that intrigues us is La Grande, home of Eastern Oregon University. It's a small northeast town (population 13,000) with an abundance of cottages and vintage homes. 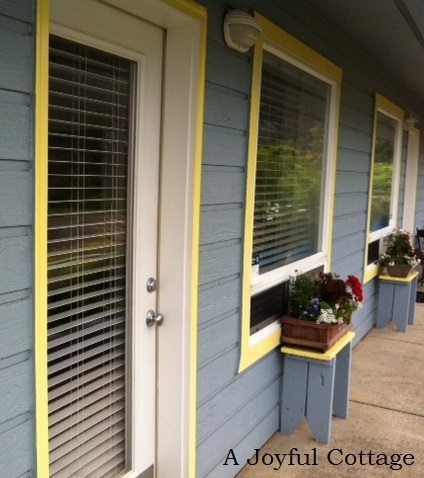 My blogging friend Connie at Crafty Home Cottage recently blogged about La Grande and its wonderful vintage homes . I asked her if I could share some of the photos she took and she graciously said, "yes". These photos were taken in April. See the flowers. See the trees leafing out. See the green grass. That's what I'm talkin' about. Be sure to stop by Crafty Home Cottage to learn more about La Grande and see more of the town's homes. Victorian, Prairie, Tudor. They're all wonderful. Connie does a great job as a tour guide, with barns and the countryside thrown into the mix. Have a great weekend. I promise I won't wait so long to post again. Sharing with Friendship Friday at Create with Joy. Changes,changes. Sending my best wishes in this new venture. . . the three cottages are quite charming . . . I kept wondering what you were up to! Bravo to you both for figuring out what would work better for you and doing all the hard work that is required to make those changes! I hope you find the cottage of your dreams there on the Oregon coast. I'm so curious about that part of the country and hope you'll take us along with you as you explore it. I appreciate your nice comments, Dewena. It will be my pleasure to blog about our adventure. That is perhaps what I'm most excited about; sharing it with others. 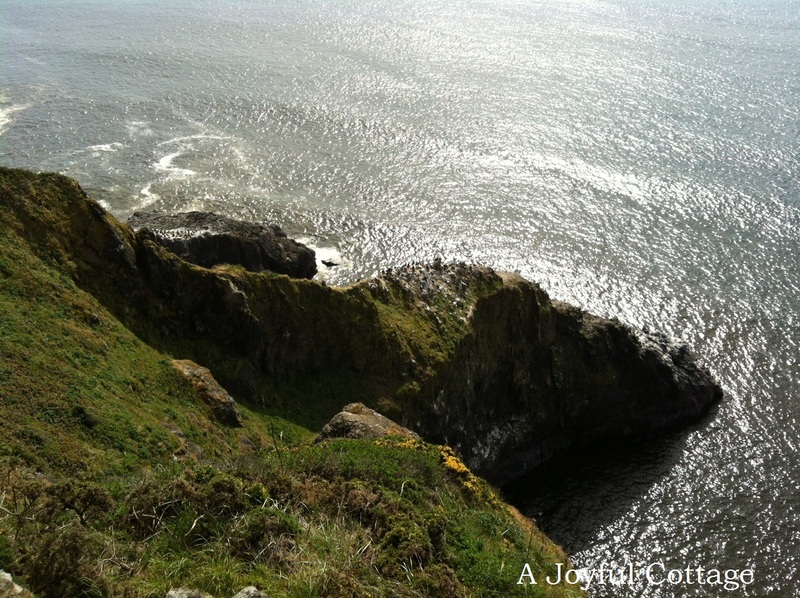 Whether we're on the coast or inland, in Oregon or some other place, you can be sure I'll write about it. Cheers! So glad to see you back blogging. Wow you have been busy. The cottage is so adorable and I like the view of that beautiful greenery and flowers outside of your room, I like the wispy grasses planted there too. 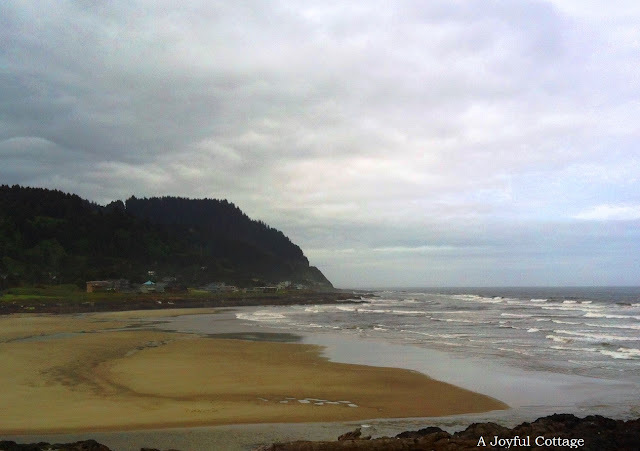 All gorgeous cottages and the Oregon coast is beautiful and I like that rugged beauty. Thank you, Betsy. I'm happy to be back and connecting with my nice blogging friends, like you. "A Joyful Cottage" has been included in the A Sunday Drive for this week. Be assured that I hope this helps to point even more new visitors in your direction. My son recently visited Portland and did not take one photo! Love your captures. It looks so pretty and green there. Portland is an interesting city. Dennis' daughter lived in Lake Oswego, a suburb, for awhile. She drove us out to Yamhill Valley where so many vineyards and orchards dot the landscape. I wonder if your son got outside of the city. It's a beautiful area. I like the wispy grasses planted there too.All gorgeous Cockermouth Self Catering Cottages cottages and the Oregon coast is beautiful and I like that rugged beauty.